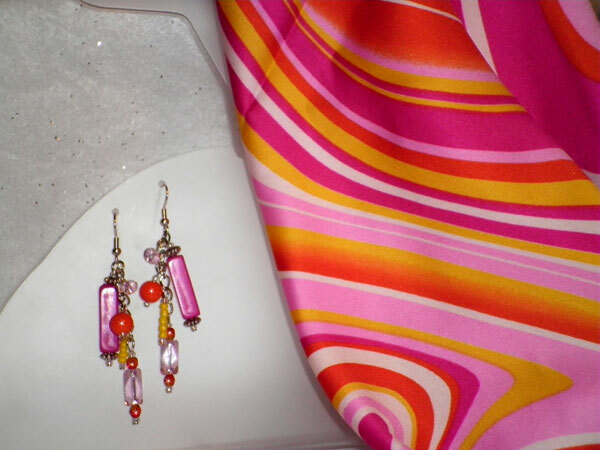 The bright waves of color in this scarf are yellow, orange, white, pink and fuschia. I had a little fun with the earrings - starting with a long acrylic fuschia rectangle accented with silver spacers. Then I've added a silver chain and decorated it with a light pink glass saucer, a bright orange round, a string of yellow seed beads, and ended with a light pink faceted glass rectangle with orange faceted rounds on either side. All are accented with silver seed beads for extra sparkle. Total length of the dangle from the finding loop is 2 1/4 inches.